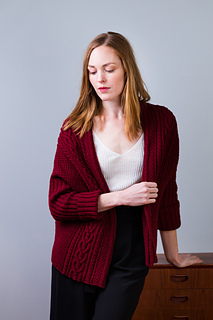 Lush cables and moss stitch make the most of Arbor’s beautiful stitch definition in this striking, sculptural cardigan. 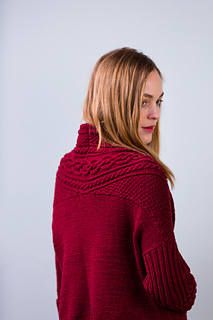 A dramatic collar is formed by extending the fronts to wrap around the shoulders and join behind the neck. 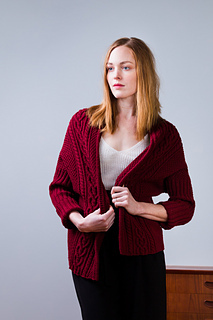 The back is picked up from the edges of the joined shoulders and knit downward as a square of stockinette with a ribbed hem. 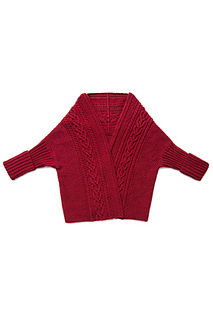 Double-ribbed sleeves are picked up and knit flat down to the cuff. Side seams are sewn to complete the piece. 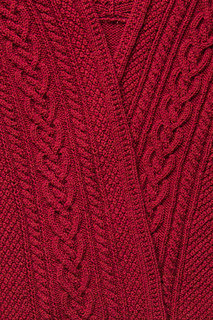 Knit in Vintner or another bright color, Akiko makes a striking statement piece, but it would be elegant in Porter or Degas.